In 1923, Henrich Focke partnered with Georg Wulf to create Focke-Wulf Flugzeugbau (Aircraft Company) in Bremen, Germany. Focke became fascinated with helicopters and other rotorcraft in the 1930s. This interest led to what is considered the first practical helicopter, the Focke-Wulf Fw 61, which first flew in 1936. That same year, Focke was ousted from Focke-Wulf due to internal disagreements about allocating company resources. In 1937, Focke partnered with Gerd Achgelis, the Fw 61’s lead designer, to create Focke-Achgelis & Co in Hoykenkamp, Germany. The new company would focus on helicopter and rotorcraft designs. The Heliconair HC-Ib Convertiplano sits nearly finished in a hangar. The slit behind the cockpit was the intake for air used to cool the fuselage-mounted R-3350 engine. The scoop on the upper fuselage brought air to the engine’s carburetor. Note the Spitfire wings and main gear. In 1941, the RLM (Reichsluftfahrtministerium or Germany Air Ministry) requested that Focke-Achgelis design a fighter capable of vertical takeoff and landing (VTOL). Focke-Achgelis responded with the Fa 269 design, which was a tiltrotor convertiplane. The Fa 269 had two rotors—one placed near the tip of each wing in a pusher configuration. The rotors were powered by an engine housed in the aircraft’s fuselage via extension shafts and gearboxes. The rotors and extension shafts leading from the right-angle gearboxes mounted in the aircraft’s wings rotated down to “push” the Fa 269 into the air, achieving vertical flight. Once airborne, the rotors and shafts would slowly translate back into the wing to propel the aircraft forward, allowing the aircraft’s wings to provide lift. The project moved forward until 1944, when much of the developmental work, including models, a mock-up, and gearboxes, was destroyed in an Allied bombing raid. 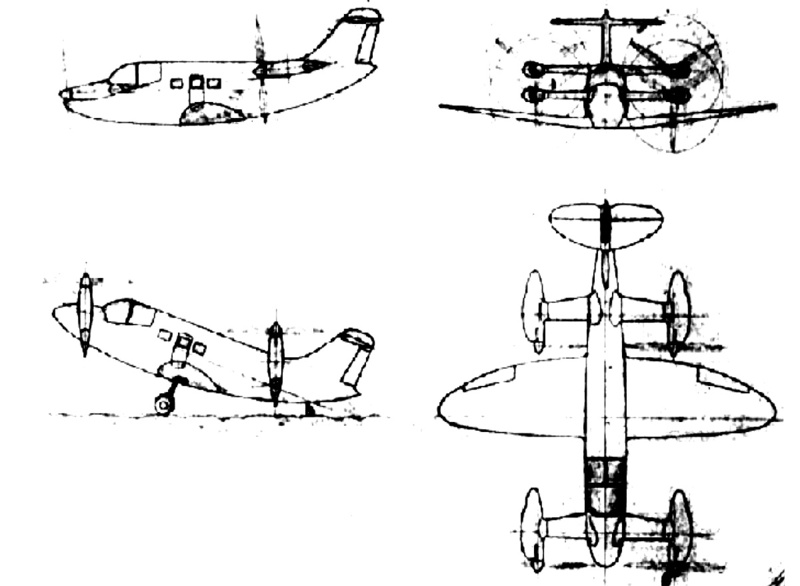 Drawings of how the completed HC-Ib was anticipated to look reveal a pretty compact aircraft, considering the engine installation and associated shafting. The R-3350 engine took up the space intended for a passenger compartment in the Double Mamba-powered HC-I. The Double Mamba would have been installed aft of the passenger compartment. Immediately following World War II, Germany was prohibited from designing and manufacturing aircraft. Post war, Focke assisted with helicopter development in France and worked for a car company in Germany. He also spent some time in the Netherlands, where he began to design a VTOL aircraft that was capable of relatively high speeds. In 1952, Focke was recruited by the CTA (Centro Técnico de Aeronáutica or Technical Center of Aeronautics) to work in the recently established ITA (Instituto Técnico de Aeronáutica or Technical Institute of Aeronautics). The ITA was the first of four institutes formed by the CTA, all of which were located in São José dos Campos, Brazil. Brazil was working on building an aeronautics and aerospace industry and was actively recruiting German engineers. In addition to Focke, many of his associates and former co-workers were also recruited. The CTA was impressed with Focke’s VTOL aircraft design and approved its construction. The CTA believed that the aircraft’s capabilities would allow it to reach remote parts of Brazil. Focke set to work on the aircraft—a tiltrotor convertiplane design that was partially inspired by the Fa 269. The aircraft was known as the Heliconair HC-I Convertiplano. 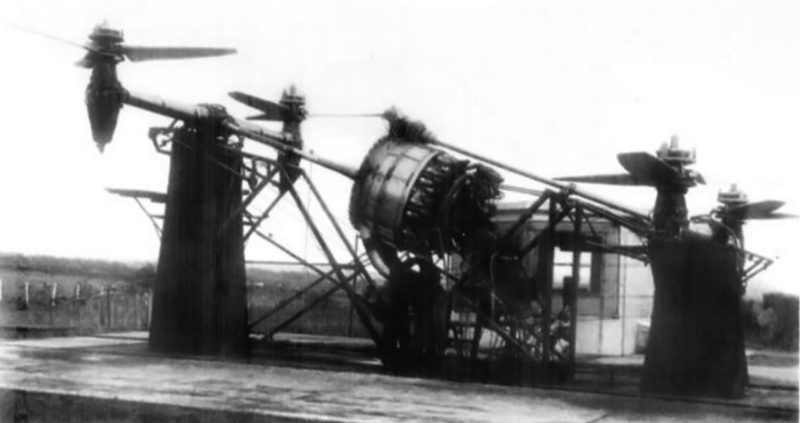 Its fuselage and wings were fairly conventional for an aircraft, but it had of two sets of rotors. One pair of rotors was placed near the nose of the aircraft, and the other pair was placed between the wings and tail. All of the rotors were of a tractor configuration and rotated up for vertical flight. The HC-I accommodated two pilots in the cockpit and four passengers in the fuselage. The aircraft’s estimated performance included a top speed of 311 mph (500 km/h) and a range of 943 miles (1,517 km). The test rig for the engine, transmission, gearboxes, shafts, right-angle drives, and rotors illustrates the complexity of the HC-Ib’s power system. The R-3350 engine did not have any Power Recovery Turbines, which means it was not a Turbo Compound engine. To save time and money, the decision was made to build the HC-I using the wings and the horizontal stabilizer from a Supermarine Spitfire. A Spitfire XIVe (RM874) was purchased without its Rolls-Royce Griffon 65 engine from Britain by the Brazilian Air Attaché on 19 December 1952. A new fuselage was built to house a 3,000 hp (2,237 kW) Armstrong Siddeley Double Mamba turboprop engine behind the passenger compartment. However, Armstrong Siddeley and the British did not want one of their new, advanced engines being used in such a radical project and declined selling a Double Mamba engine to Brazil. 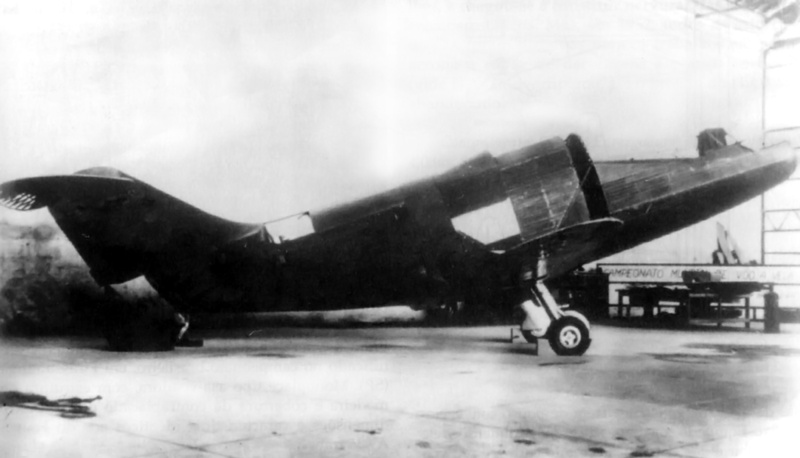 Focke and the Convertiplano team changed the HC-I’s design to accommodate a 2,200 hp (1,641 kW) Wright R-3350 radial engine and redesignated the aircraft HC-Ib. The R-3350 was larger and heavier than the Double Mamba, and it produced less power. Some sources state a Turbo Compound R-3350-DA3 (3,250 hp / 2,424 kW) was used, but images show that there are no Power Recovery Turbines on the engine installed in a test rig. Extensive modifications to the aircraft’s fuselage were required to accommodate the air-cooled engine. The passenger compartment was omitted, and the R-3350 was installed in the middle of the fuselage. An annular slit behind the cockpit was added to bring in cooling air for the engine. After passing through the engine’s cylinders, the air exited via a jet-like duct at the rear of the aircraft. The Spitfire’s landing gear was strengthened to compensate for the R-3350’s weight. The HC-Ib sits in the background with the front and rear gearboxes and rotor drives in the foreground. 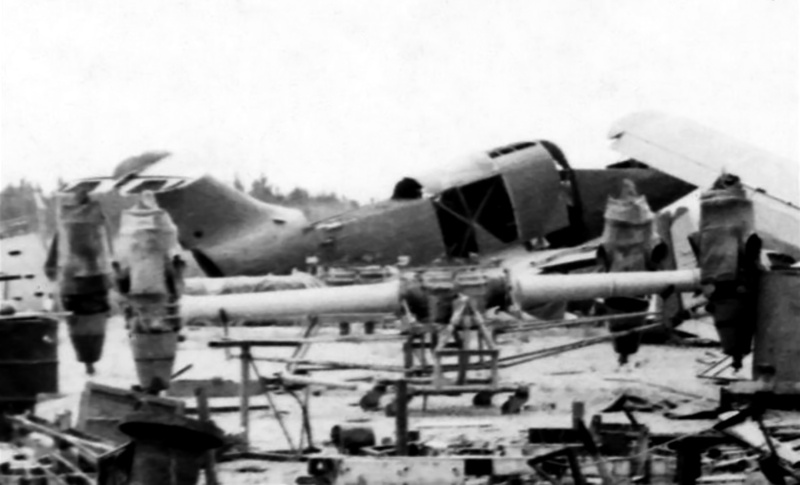 The rotor blades, the only surviving component of the Convertiplano project, are not seen in the image. Note the opening at the rear of the fuselage, which was the exit for engine cooling air. A gearbox transmission mounted to the front of the R-3350 split the engine’s power to two shafts. The front shaft extended from the engine to the front gearbox. The front gearbox had shafts that extended to the left and right. These shafts led to right-angle gearboxes that powered the front rotors. Power delivery for the rear rotors was more complex. A shaft extended vertically from the transmission on the front of the engine and met a right-angle gearbox positioned directly above the engine. From the right-angle gearbox, a shaft extended back to the rear gearbox. The rear gearbox had the same shafts and right-angle drives for the rear rotors as the front gearbox. The transmission and gearboxes were designed by Willi Bussmann and built by BMW in Germany. Bussmann was a former BMW employee and had worked with Focke on several Focke-Achgelis projects. Each rotor consisted of three blades. The blades were built in Sweden and made of a steel frame that was covered with wood. The blades’ pitch automatically adjusted and had collective and cyclic control. The rotors were counter-rotating, with the right rotors turning counterclockwise and the left rotors turning clockwise. The HC-Ib had a 37 ft 6 in (11.42 m) wingspan and was 35 ft 3 in (10.74 m) long. 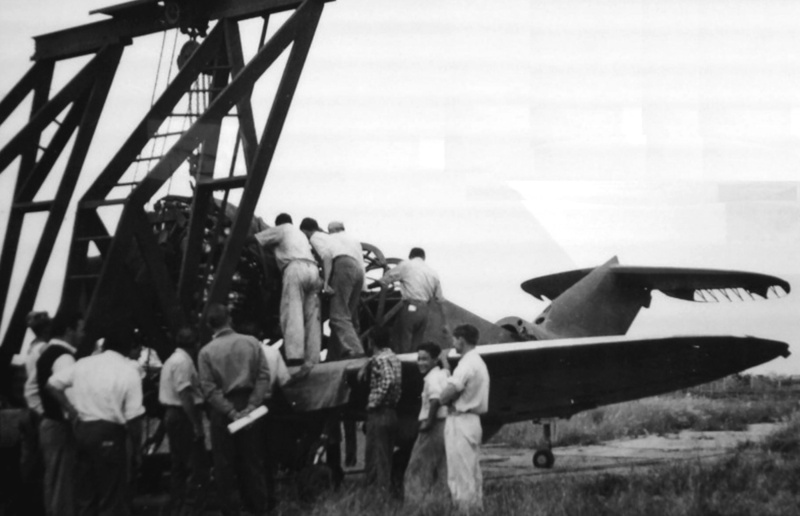 Given the state of the aircraft and the surrounding unchecked growth of vegetation, it can be assumed this image is of the R-3350 engine being removed sometime after the HC-Ib project was cancelled. The image does give proof that the engine was installed in the airframe at one point. A rig was built, and tests of the engine, gearboxes, shafts, right-angle drives, and rotors began in late 1953. However, vibrations from the radial engine caused some issues that took time to resolve. The HC-Ib airframe was almost completely constructed and had its engine installed when the project was cancelled in 1955. The aircraft was more expensive than anticipated, and interest in the HC-1b had steadily declined after the switch to the R-3350 engine. To make matters worse, many of the Germans returned to Europe or went to the United States as their contracts with the CTA expired. Some Germans did stay and ultimately became part of Embraer. After the project was cancelled, the HC-Ib Convertiplano was left to rot in outside storage for some time and was eventually scrapped in the 1970s. There are some reports that the rotor blades are the only part of the aircraft that survived. A follow up Convertiplano project was considered. Designated HC-II, the aircraft would be powered by four 1,400 hp General Electric T58 turboshaft engines and reincorporate a four to six passenger cabin. The HC-II never progressed beyond the initial design phase. The C-II Convertiplano had a GE T58 engine mounted directly to each of its four rotors. Otherwise, it retained the configuration of the original HC-I. This entry was posted in Aircraft, Post World War II, Rotorcraft on 20 March 2017 by William Pearce.